Scotty Kay was born for the spotlight, getting his big break as one of twenty five male finalists on the first season of FOX’s hit television show, “So You Think You Can Dance.” Listeners who follow Scotty’s live events always get an exciting experience, as he’s been named one of the best live entertainers in the nation four times by DJ Times Magazine and hosts events worldwide, including the Ambassadors Ball for NATO in Brussels, Belgium. Born and raised in Chicago, Scotty happily found his place at WKSC-FM (103.5 Kiss FM) Chicago where he successfully made a real connection with his loyal listeners all over the country as a syndicated personality heard in over 7 cities nation wide. His major market radio and live entertainment experience brought a special excitement to Power 96.1, the city of Atlanta and His syndicated markets. Taking the Show from 18th place to 1st in 20months. Scotty loves to donate his efforts to charitable causes for kids aimed at keeping the arts and implementing dance in schools, as well as finding homes for sheltered animals. He continues to find ways to help the community and that includes being a national Emcee for the Susan G. Komen and Starlight Children’s foundations. They say behind every good man stands a good women, that is most certainly true in Bret’s case as he is getting married to his high school sweetheart on their 10 year anniversary. Bret and Katie did 7 years long distance when Bret did radio all over the country. He began his career with Scotty at WKSC 1035 KISS FM in Chicago, before moving off to Spokane, WA to do the night show on KZBD NOW 1057. After a year of success and posting #1 ratings the station moved him to mornings. Again, Bret took the morning show to #1 18-34 persons and the station rewarded him with syndication through out their Company! The long distance, was enough for Bret he finally moved to be with his Fiancee to one of the greatest music cities in the country Memphis, TN. 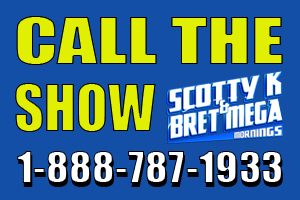 Bret did afternoons where he was able to double the ratings in a short time. Finally, Scotty and Bret reunited in Atlanta at WWPW POWER 96.1. In 20 months together this team took the 18th place morning show to #1. Bret Mega brings an approach ability on the air. He is everyone best friend the neighbor you turn to share your deepest secrets too and turn to advice. He is not afraid to share ANYTHING on the air, which sometimes gets him in trouble at home! He also, isn’t afraid to ask ANYTHING no matter how awkward it makes things. He loves helping listeners and believes radio can make a difference in people’s lives.